The aim of CoDyCo is to advance the current control and cognitive understanding about robust, goal- directed whole-body motion interaction with multiple contacts. The CoDyCo project is a four-years long project and starts in March 2013. At the end of each year a scenario will be used to validate on the iCub the theoretical advances of the project. The aim of CoDyCo is to advance the current control and cognitive understanding about robust, goal- directed whole-body motion interaction with multiple contacts. CoDyCo will go beyond traditional approaches: (1) proposing methodologies for performing coordinated interaction tasks with complex systems; (2) combining planning and compliance to deal with predictable and unpredictable events and contacts; (3) validating theoretical advances in real-world interaction scenarios. 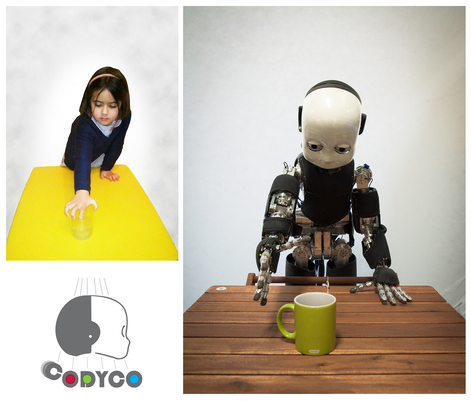 First, CoDyCo will advance the state-of-the-art in the way robots coordinate physical interaction and physical mobility. Traditional industrial applications involve robots with limited mobility. Consequently, interaction (e.g. manipulation) was treated separately from whole-body posture (e.g. balancing), assuming the robot firmly connected to the ground. Foreseen applications involve robots with augmented autonomy and physical mobility. Within this novel context, physical interaction influences stability and balance. To allow robots to surpass barriers between interaction and posture control, CoDyCo will be grounded in principles governing whole-body coordination with contact dynamics. Second, CoDyCo will go beyond traditional approaches in dealing with all perceptual and motor aspects of physical interaction, unpredictability included. Recent developments in compliant actuation and touch sensing allow safe and robust physical interaction from unexpected contact including humans. The next advancement for cognitive robots, however, is the ability not only to cope with unpredictable contact, but also to exploit predictable contact in ways that will assist in goal achievement. Third, the achievement of the project objectives will be validated in real-world scenarios with the iCub humanoid robot engaged in whole-body goal-directed tasks. The evaluations will show the iCub exploiting rigid supportive contacts, learning to compensate for compliant contacts, and utilizing assistive physical interaction.